First in line to the Norwegian throne, this son of King Harald V held the titles of both Crown Prince of Norway and Prince of Denmark. 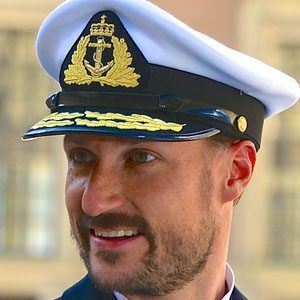 During late 2003 and early 2004, while his father was recovering from cancer treatment, Crown Prince Haakon served as Regent of Norway. After serving in the Royal Norwegian Navy, he earned a political science bachelor's degree from the University of California, Berkeley, and an international trade and development studies master's degree from the London School of Economics. He was part of the opening ceremony at the 1994 Winter Olympics in Lillehammer, Norway. His marriage to Mette-Marit Tjessem Høiby (later Crown Princess of Norway) spurred controversy, as Høiby was both a single mother (to son Marius Borg Høiby) and a commoner. The couple welcomed a daughter, Princess Ingrid Alexandra, in 2004, and a son, Prince Sverre Magnus, in 2005. He was born to Harald V of Norway and commoner Sonja Haraldsen.